Draft Of Bob Dylan's 'Like A Rolling Stone' Sells For $2 Million : The Two-Way The scribbled lyrics of one of the most iconic rock songs of all time are recorded on hotel stationery and contain a number of alternative lines as well as doodles of animals. 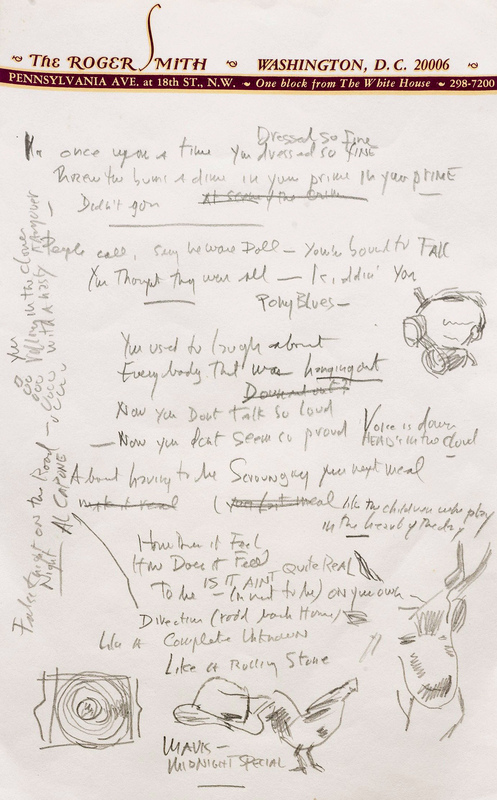 A photo provided by Sotheby's shows a page from a working draft of Bob Dylan's "Like a Rolling Stone." The draft sold for more than $2 million. 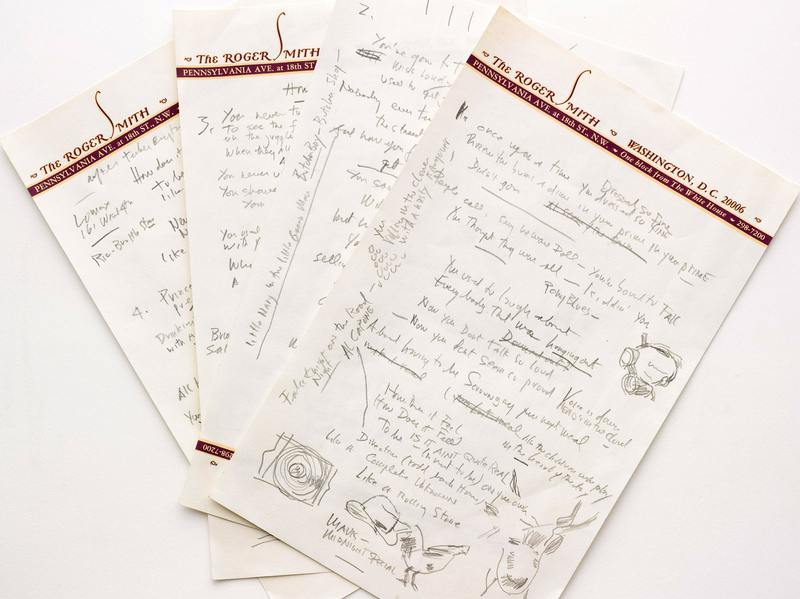 Lyrics scribbled on hotel stationery circa 1965 that later became one of the most iconic rock songs of all time, Bob Dylan's "Like a Rolling Stone," has fetched more than $2 million in an auction at Sotheby's. 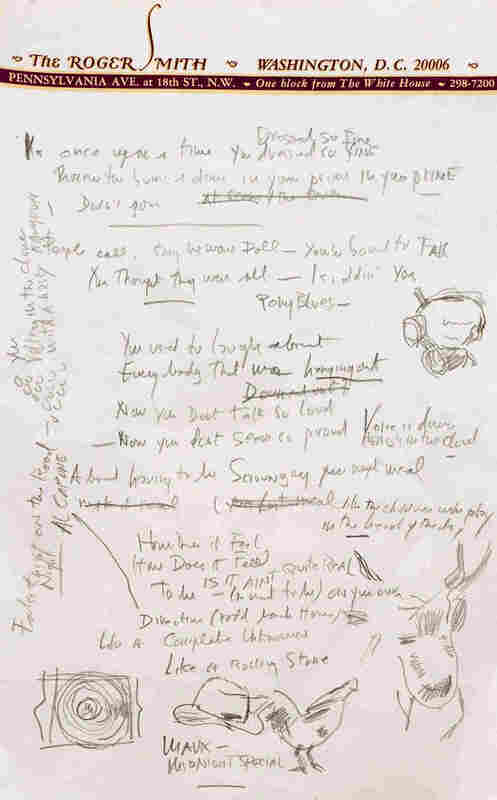 What the auction house describes as "the only known surviving draft of the final lyrics for this transformative rock anthem" is four pages written on stationery from The Roger Smith Hotel in Washington, D.C., containing line-outs, changes and doodles. The full 4-page draft, in a photo released by Sotheby's. The song, written when Dylan was just 24 but already well on his way to stardom, appeared on the album Highway 61 Revisited. It rose to No. 2 on the Billboard charts, despite the reluctance of some radio stations to air it because of its length (more than six minutes at a time when most pop songs were three to four minutes long). -- Under "Threw the bums a dime in your prime," Dylan has scratched out: "At scene of the crime." -- In the line that was recorded as: "You used to laugh about / Everybody that was hanging out," Dylan had originally written "Everybody that was down and out?" before crossing it out. -- After "Now you don't seem so proud," is written "Voice is down" and "Head's in the cloud." -- He may also have been trying out alternative rhymes for "scrounging your next meal" — "make it real" and "your last meal" (both scratched out) and something entirely different: "like the children who play in the heat of the day." -- After the plaintive and cynical refrain "How does it feel?" Dylan has written in mixed caps: "IS IT AINT Quite ReaL." -- And "No direction home" looked tentatively to be "road back home," but in the margins with an arrow pointing to it is another, stranger, alternative: "False Knight / Night on the road. AL CAPONE."